Marseille doesn’t feel like France. A stroll around this Mediterranean city is completely unlike anywhere else – and that’s not necessarily a bad thing. Marseille has long had a reputation for being an outsider city, in fact, it was a city rampant with drugs and corruption in the 1970s until the early 21st century when things began to turn around. It began by winning the right to be the European Capital of Culture in 2012 and has continued to push forward ever since. Sure, it may still be a little rough-around-the-edges and in need of a polish, but that’s what makes it unique and we wouldn’t have it any other way. It all depends on which port you are docked in. Larger ships are docked in the Môle Léon Gourret port situated roughly 5km to the north of the city centre. You could take a taxi into the city centre or jump on the shuttle bus put on by your cruise line (and while this is often the case, it is best to check with guest services before committing). If you are cruising with a smaller or luxury ship, chances are you’ll be lucky enough to be docked in La Joliette port which is a mere five-minutes stroll into the heart of the city. The Old Port (Vieux Port): To get a feel for the city of Marseille you need to explore The Old Port – central to the city’s growth dating back to the Middle Ages. There’s plenty of restaurants, cafes and bars to explore, you can also indulge in some of the local seafood or take a walk to St. Victor’s Abbey and Phare de Sainte Marie (the old lighthouse) if you are feeling more cultured. But it’s just as pleasant to wander around the old harbour and do a spot of people-watching. 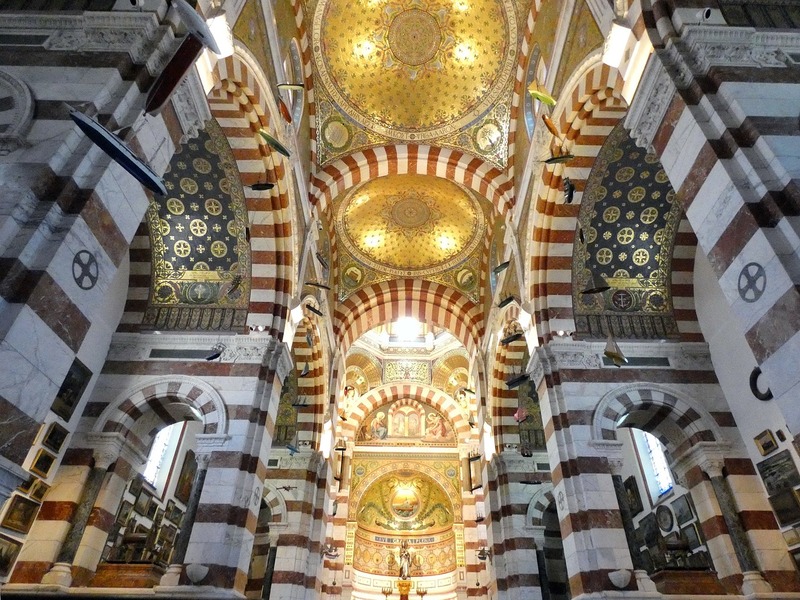 Notre-Dame de la Garde: Probably Marseille’s most famous ¬– and most stunning – site. Still a key part of the city’s religious make-up with thousands making the pilgrimage every year for Assumption Day, the non-religious will have to make do with the Neo-Byzantine architecture and the stunning views of the city below. Note: it is possible to walk to the top of the hill the cathedral sits on, however this is fairly steep and you may be better off catching the regular bus to the top instead. The Mucem: One of the main reasons that Marseille was named European Capital of Culture back in 2012 was this incredible museum dedicated to the Mediterranean. From the striking contemporary architecture which catches the eye from miles away, to the fascinating exhibits about the history of the great nations of the Med, there’s plenty to be enjoyed at this newest addition to Marseille’s burgeoning cultural repertoire. Chez Fonfon: Marseille’s signature dish is the supremely fishy bouillabaisse (fish stew) and nowhere serves it better than this local institution. Chez Etienne: France may not be your first choice for a pizza restaurant, but this Marseille-favourite bucks the trend, offering a cheese-and-anchovy pizza to die for. La Kahena: Looking to savour some of Marseille’s African influence? Then you’ll want to head to this Tunisian favourite based right next to the Old Port. La Canebière: Not quite Marseille’s answer to the Champs-Élysées as it once was, but this is still a historic shopping area with some interesting sights to behold. Old Port Fish Market: Haggle for the ‘Catch of the Day’ at this famous market held daily in the Old Port – it’s worth seeing for the spectacle alone. Centre Bourse: Marseille’s largest shopping centre with roughly 60 shops to explore and browse for souvenirs. A must visit for shopaholics. If you want to make sure you have the most authentic bowl of bouillabaisse possible, call ahead and let the restaurant know you’ll be ordering it. This fish stew is meant to simmer for hours and hours before serving and anything less is not good enough.